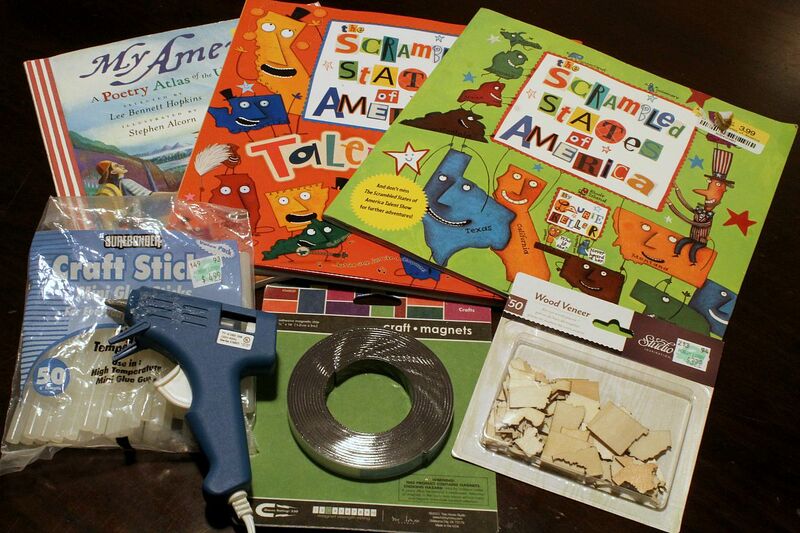 If you’re thinking of introducing US geography to your children, consider these great books as well as a craft and activity ideas to jump start the fun! This book is a silly introduction to our nation’s 50 states. 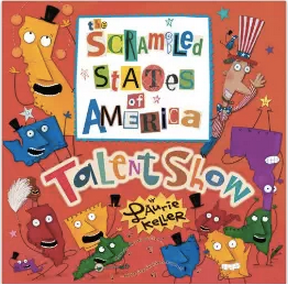 The thing I love most about this book is that it introduces the name and shape of each state. 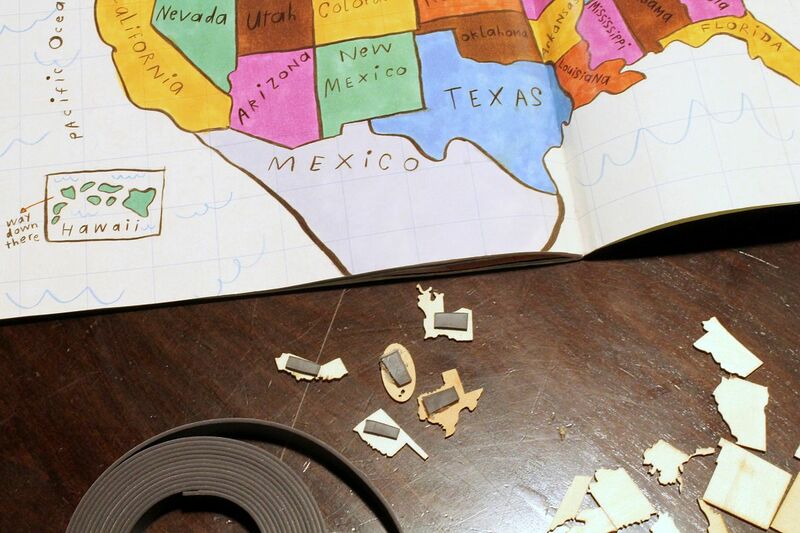 The book also features the physical location of each state as part of the story. All my kids love this lighthearted introduction to US geography. This sequel introduces the idea of cities, counties, state abbreviations, and order of statehood. It follows in the fun-loving personality of the original book. My kids were excited to follow up with each of the states that they “met” in The Scrambled States of America. This is a great US geography book for older children. 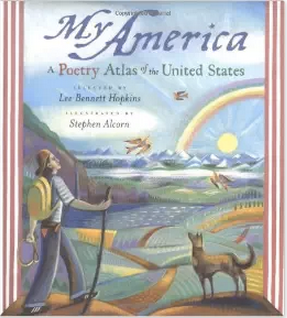 It’s a delightful collection of poetry that highlights the diverse regions of our nation. The book introduces the concept of geographic regions that tie our states together and give them a mutual heritage. The best part of this book is the vibrant illustration by Stephen Alcorn. What breathtaking and heart-warming imagery he shares with us! 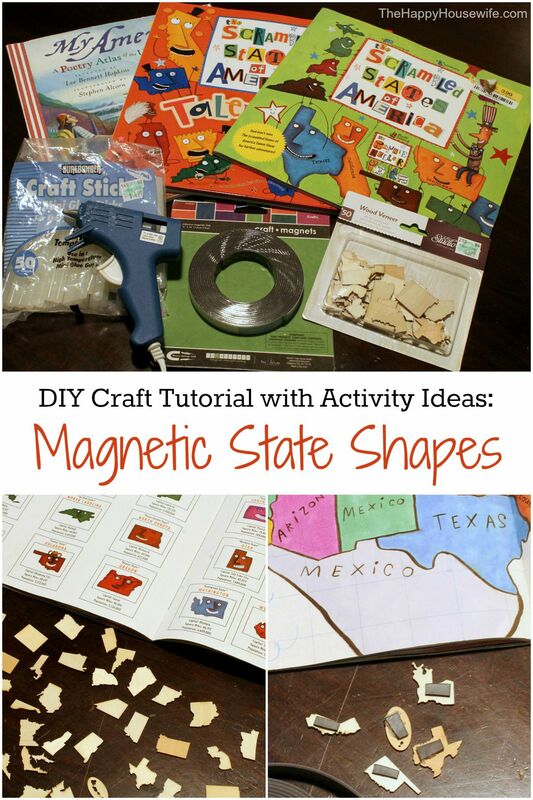 I saw these little state shape cutouts and I thought it would be a fun craft idea to make magnets. Other state cutouts were in the scrapbook area of my craft store, but the wood veneer seemed like a better choice instead of cutouts from card stock. Please note that this is not a puzzle. The states are not to scale and they do not fit together. 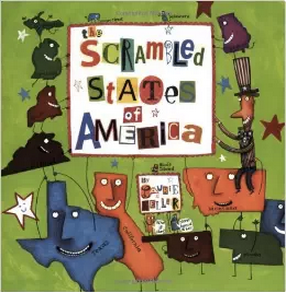 It’s a fun way to learn about state shapes and maybe play a little matching game with your Scrambled States of America state shape pages. The hardest part might be making sure the magnet goes on the “back” of each state. It took me quite a while to make sure the states were facing the correct direction since the front and back have the same finish. 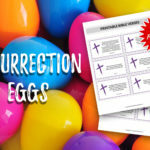 This is a fun way to get the kids involved making sure they’re all lined up correctly. Use caution when heating up the glue gun. 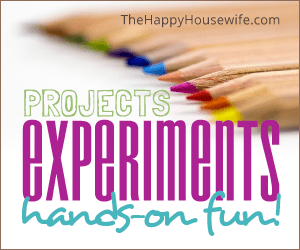 Children must have supervision to avoid burns with these high temperature craft tools. I like to set my glue gun on a piece of foil lined parchment to protect the craft table from gooey drips. Cut the magnetic strip to the tiny length you need for each piece. The magnetic tape has a self-adhesive backing, but I use a glue gun to make sure that everything stays put together solidly for as long as possible. Apply the magnet pieces to the back side of the states. Allow the glue to cool completely. These states will stick to any metal surface like a magnetic white board, a fridge, or even a cookie sheet, which makes them easily portable from room to room! Use with magnetic letters to try and spell the state names. 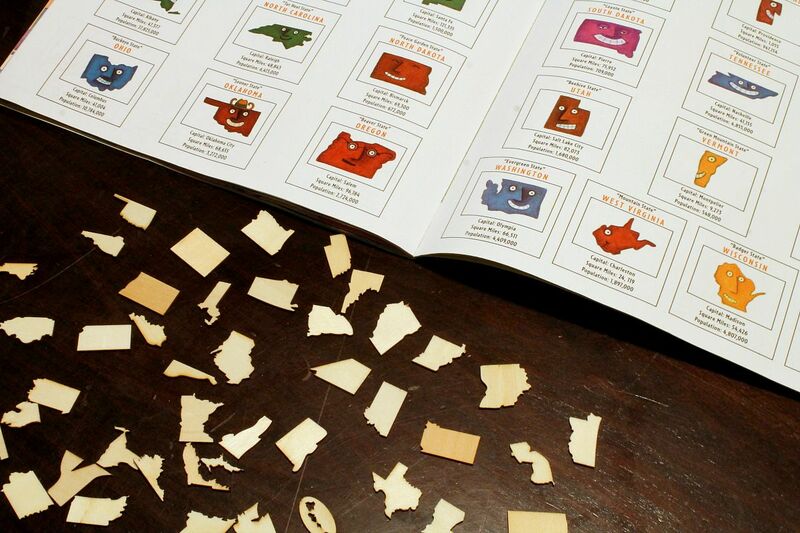 Match the state shapes with the state identification page in The Scrambled States of America. Group together states that are in the same geographic region. Use the shapes to talk about places you’d like to visit. Have the child draw a picture of what they’d do if they visited each state. Show state shapes when you talk about friends and family in different states. 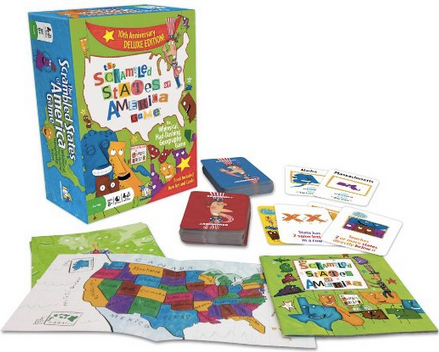 Fun Tip: You can also have hours of geography fun with the Scrambled States of America Game. 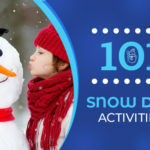 It’s a blast for kids who are reading age. 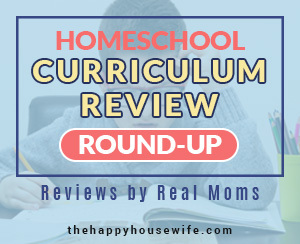 They have fun while learning about state nicknames, state capitals, and so much more!